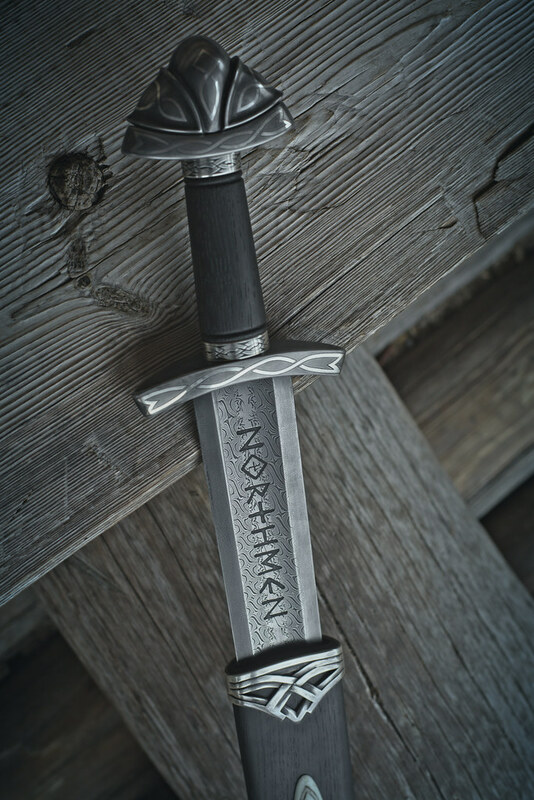 Please write an email to guild@northmen.com about pricing and waiting list of this sword. 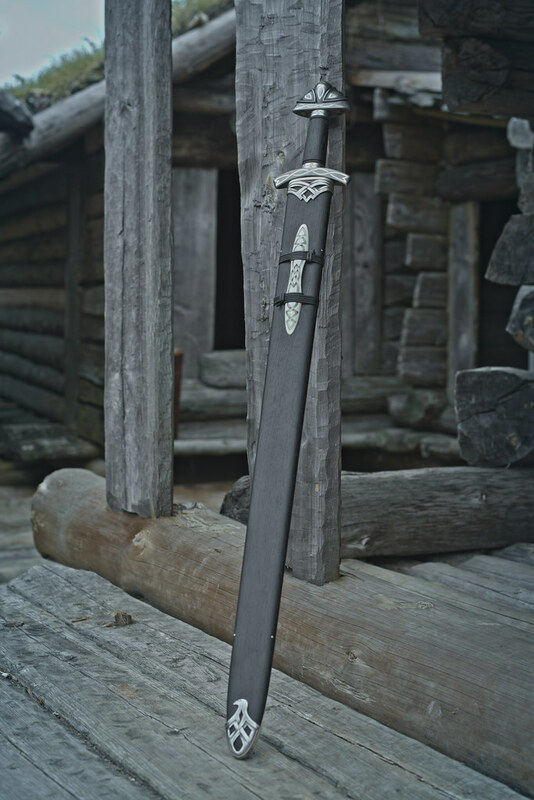 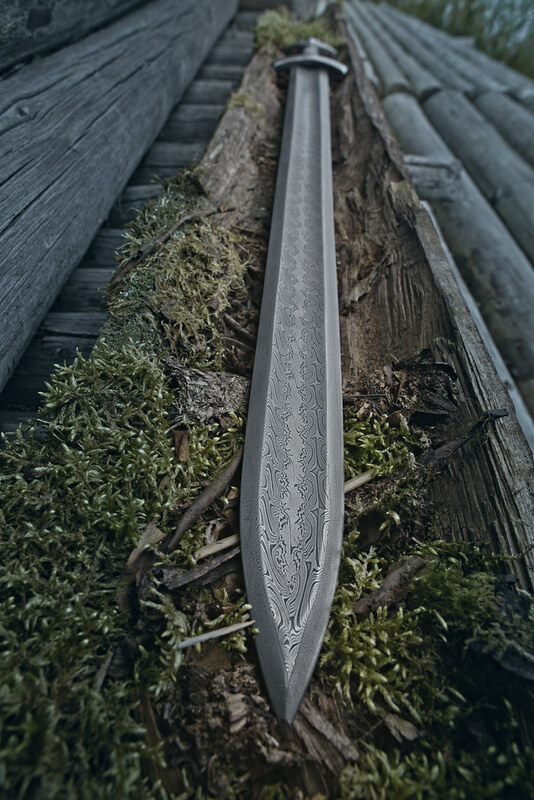 This sword is based on historical Viking's sword lines and proportions (Petersen type R) dated back to 10th century. 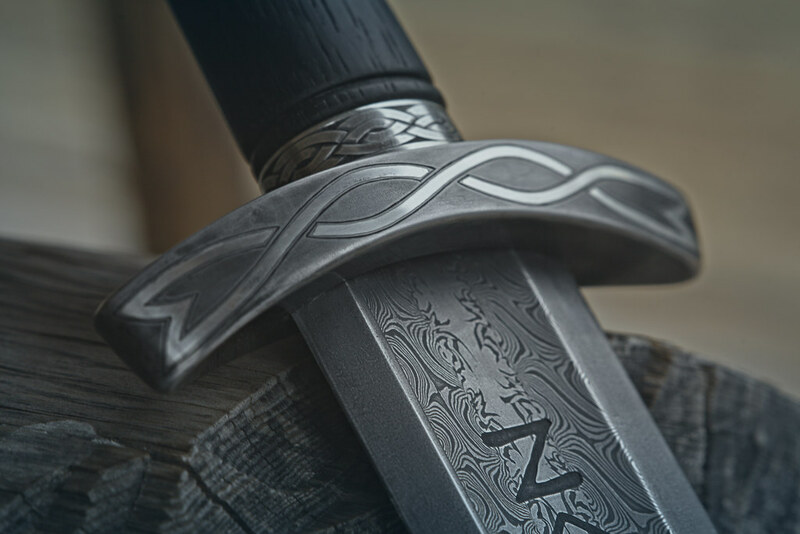 It is based on historical findings and research that our friend bladesmith and artist from USA - Dave DelaGardelle from Cedarlore Forge designed this sword with and all its details. 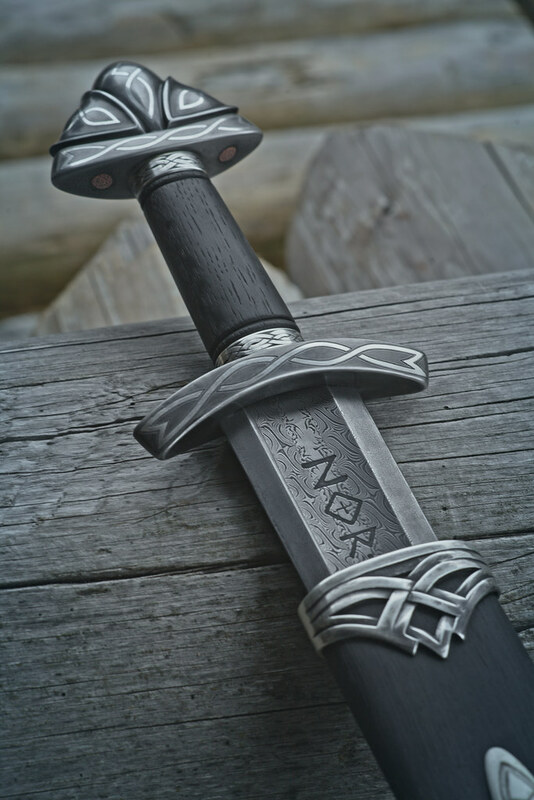 This is a result of four months hard work of four of our guild's master craftsmen - two bladesmiths - Gregory and Chris, fine woodworker Mr. Armands Vilisters and jeweller/engraver Mr. Linards Potchs. 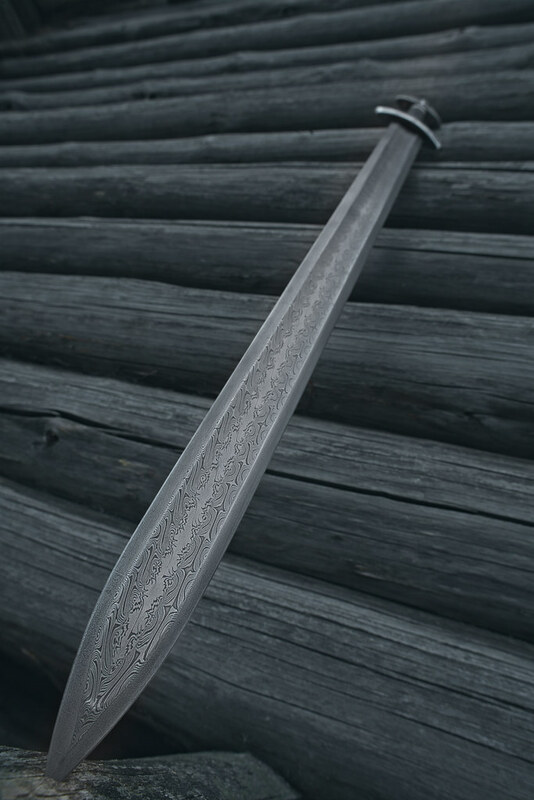 The blade is crafted using very similar forge welding techniques used on sword blades forged back in 10th century. 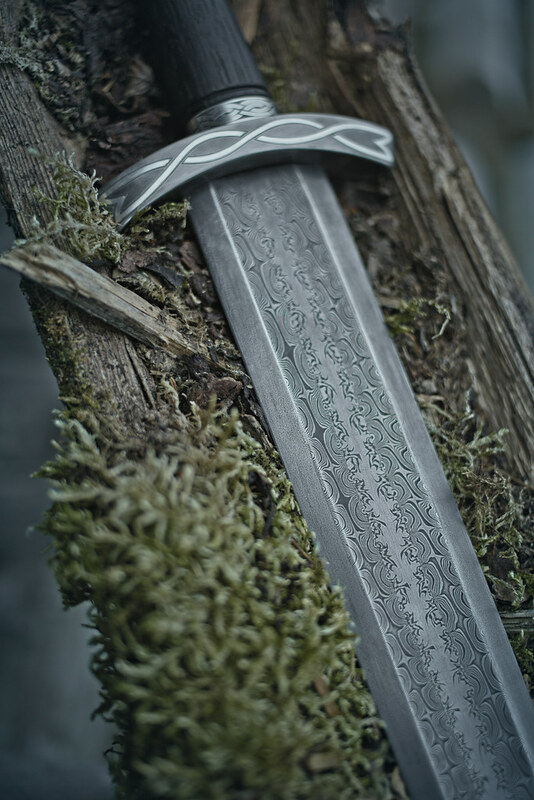 The profile of the blade is forged as three damascus bars, each one of 320 layers forge welded together in the middle (fuller) of the blade and high carbon steel is forge welded as the cutting edges, making sword break and crack resistant. 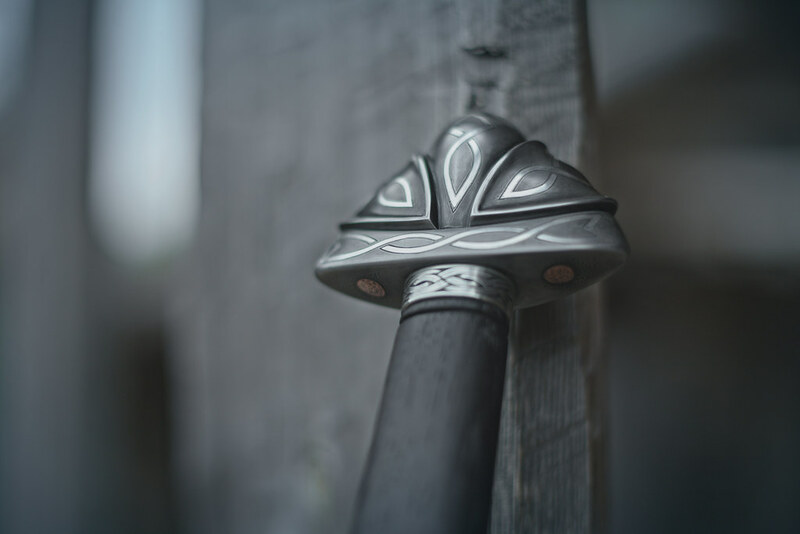 The sword's hilt - guard, grip and pommel, is built to land the sword's balance and pivot points on the sword's tip making it battle ready. 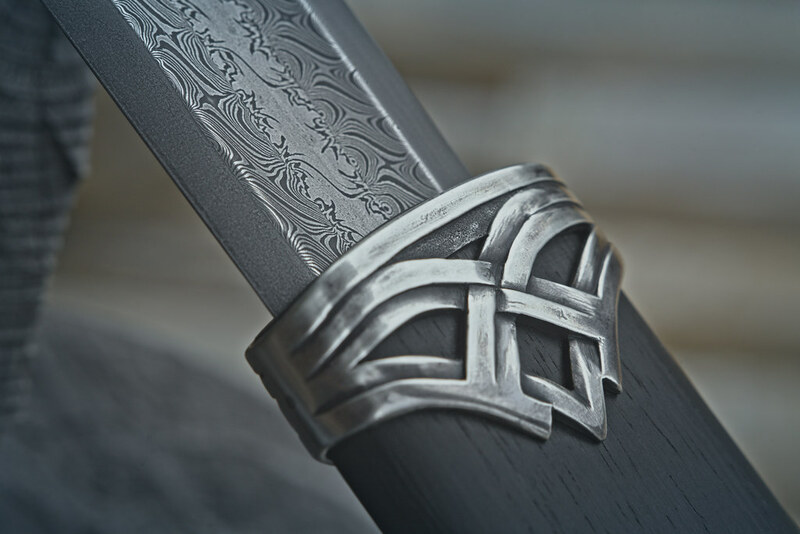 The guard and pommel are forged and shaped out of old pieces of iron and inlaid with Sterling silver decorations. 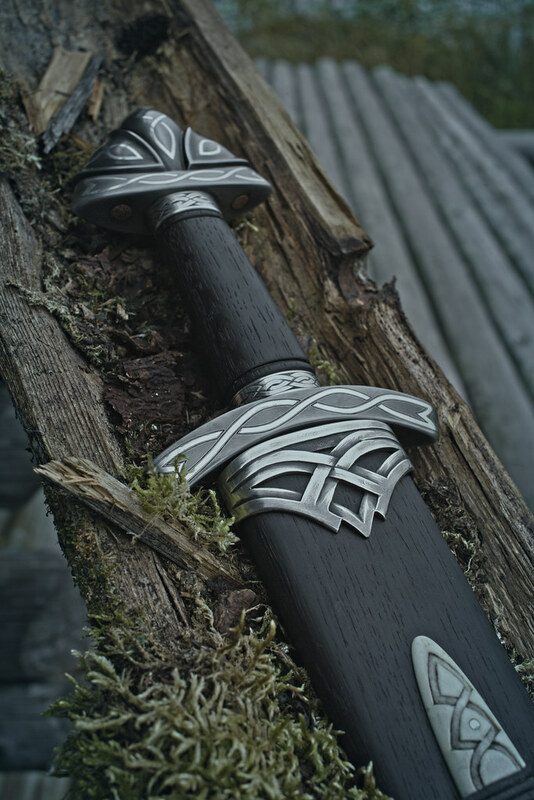 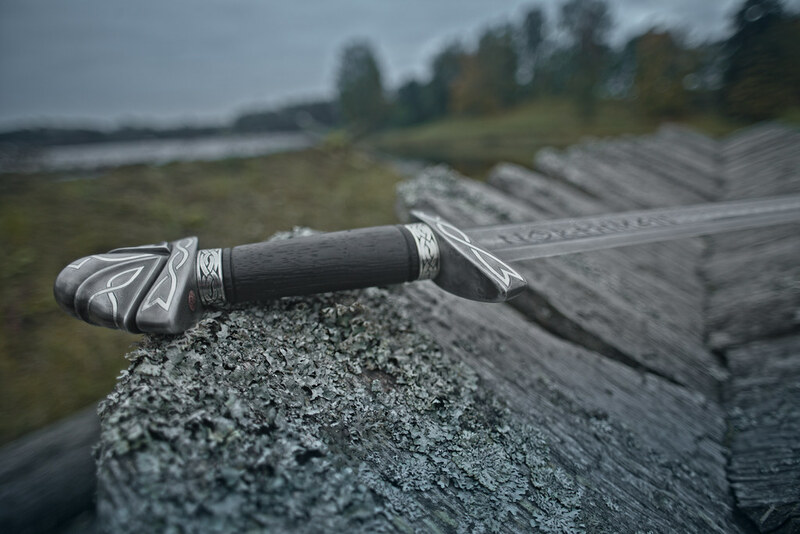 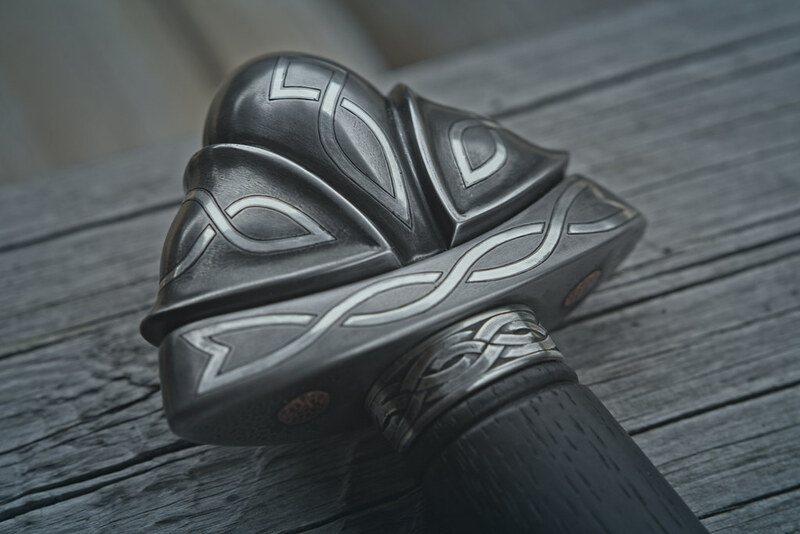 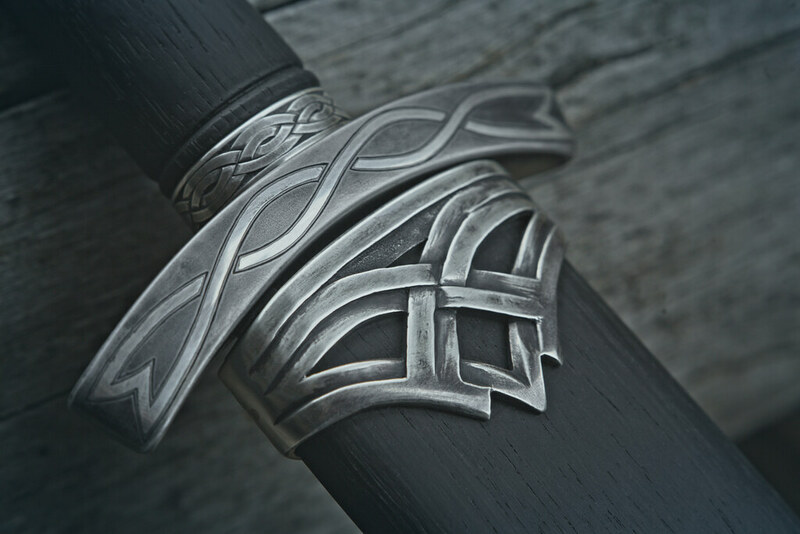 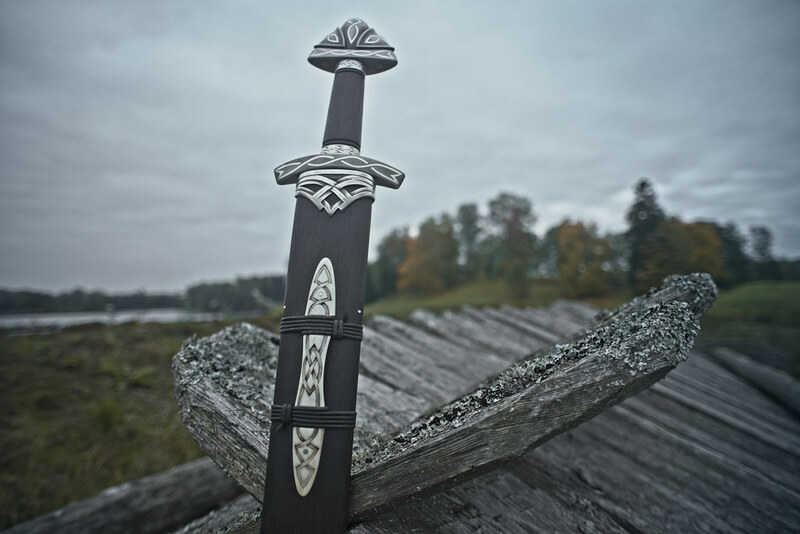 The sword grip and scabbard are created out of old English Bog Oak found in bogs under six meters of soil (peat), where it has been for more than 5600 years. 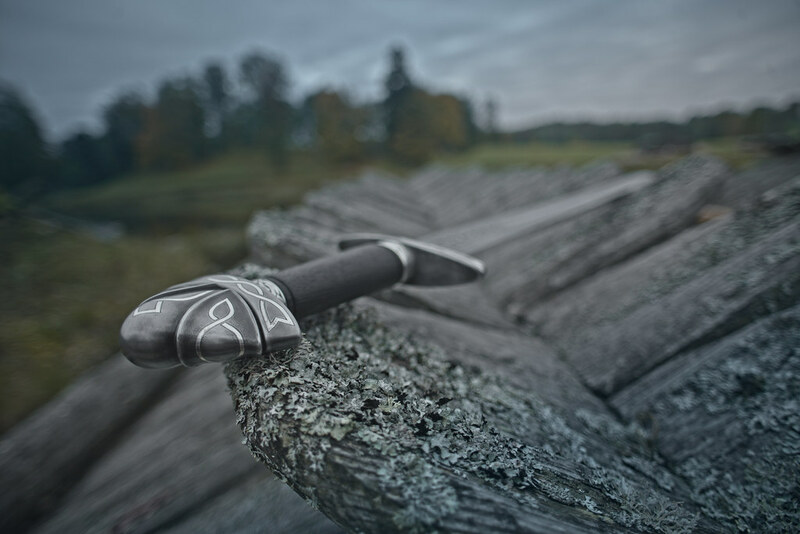 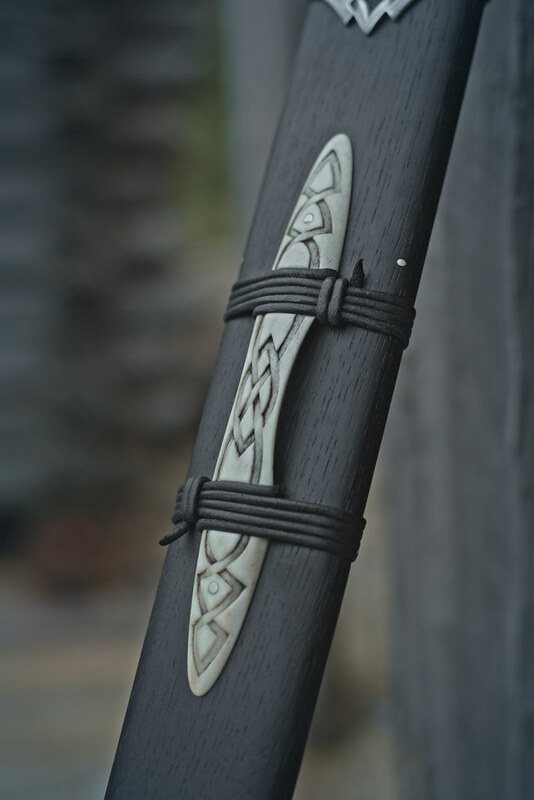 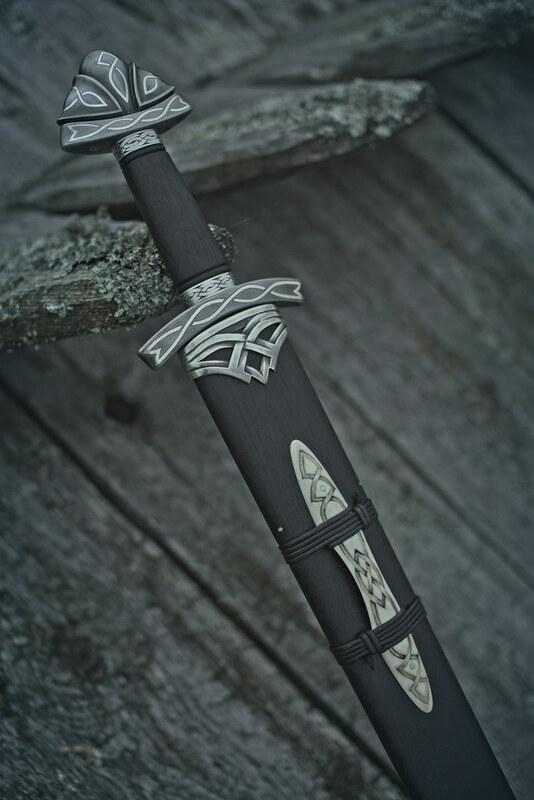 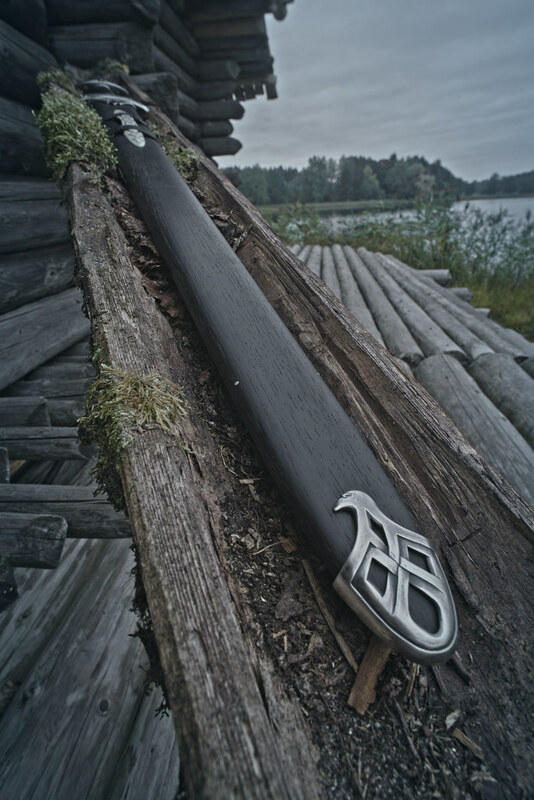 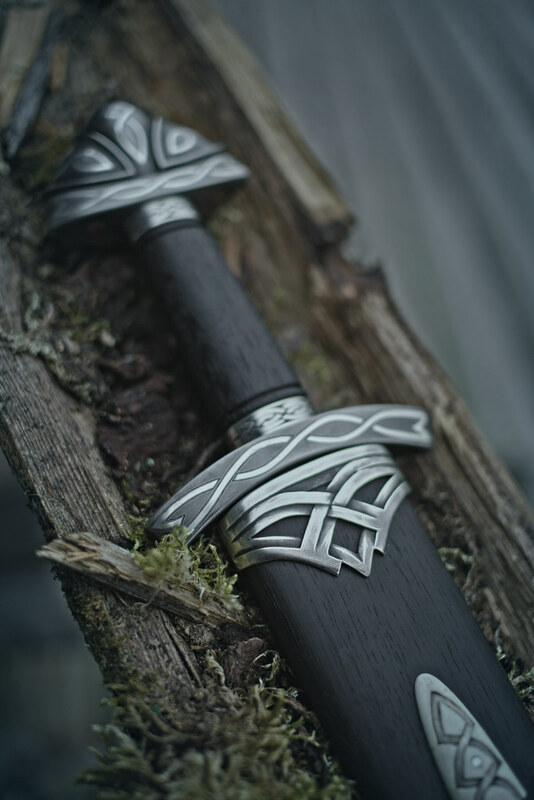 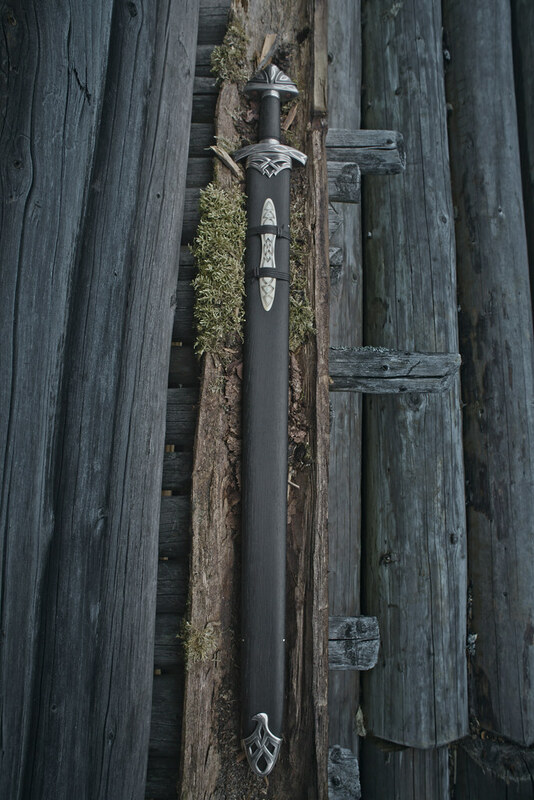 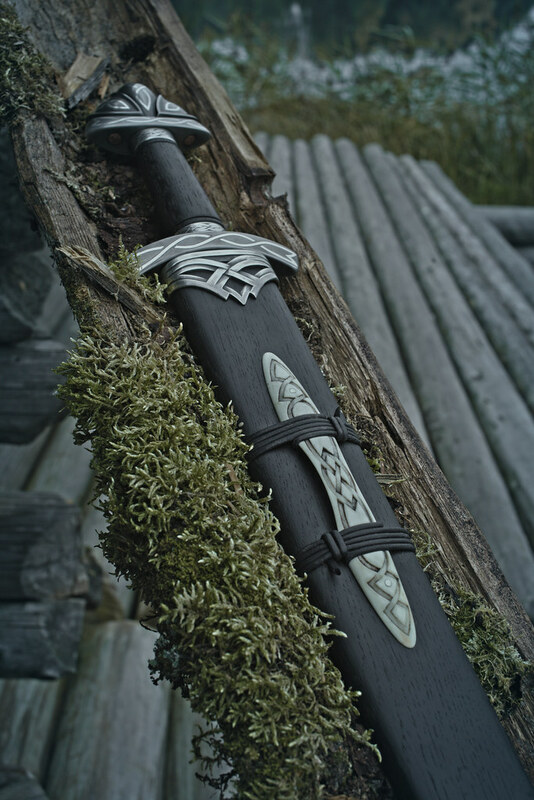 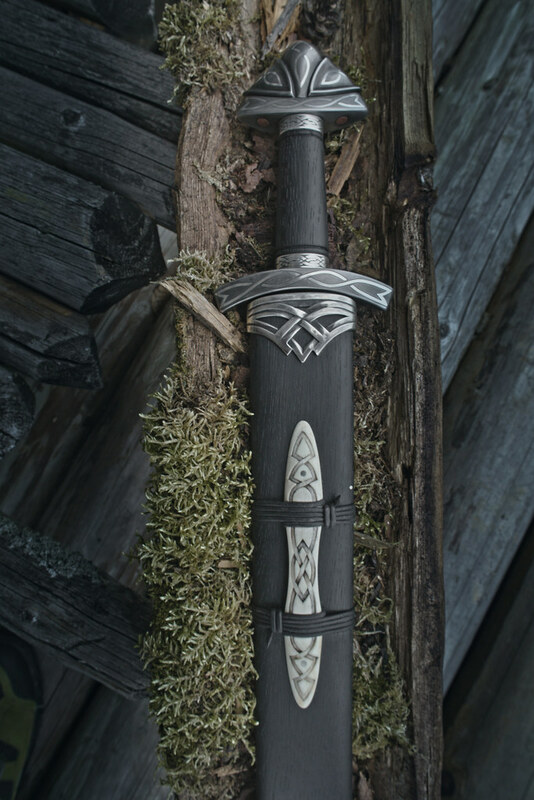 The scabbard has moose antler decorations fixed with silver pins and a leather strap. 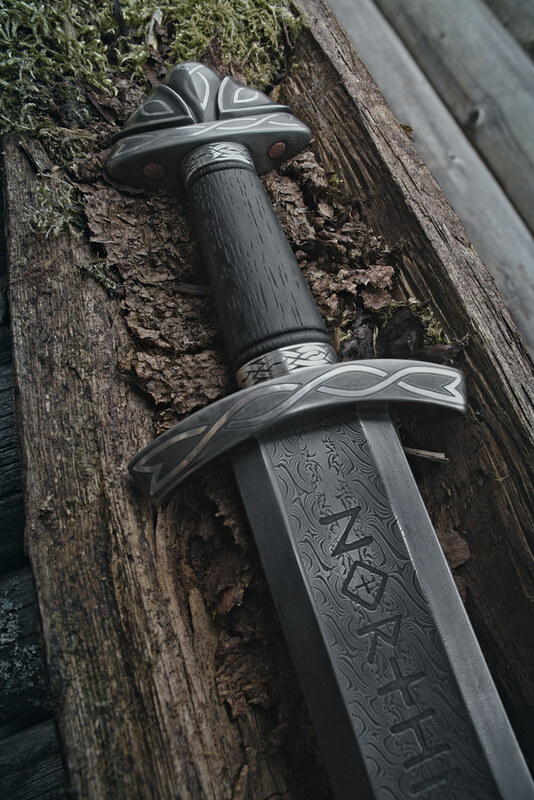 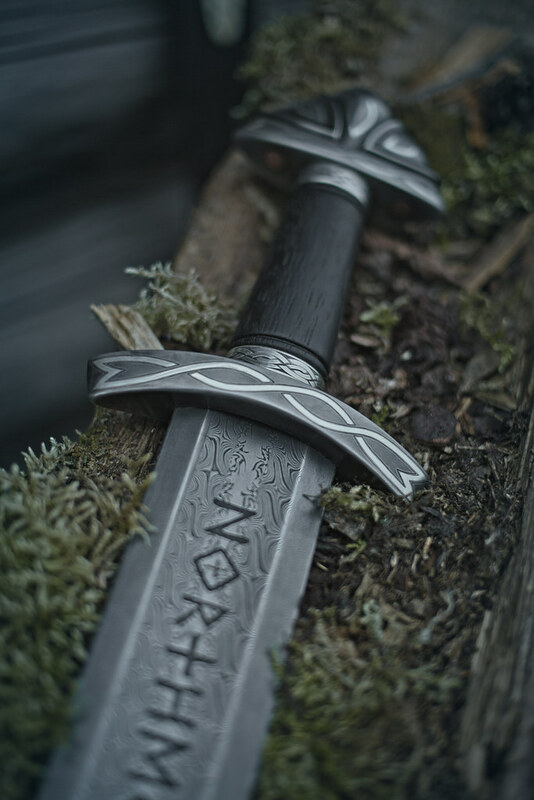 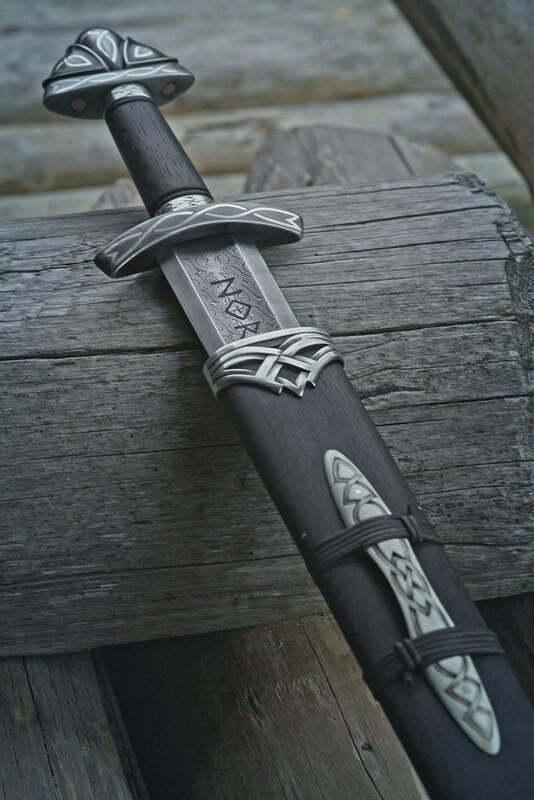 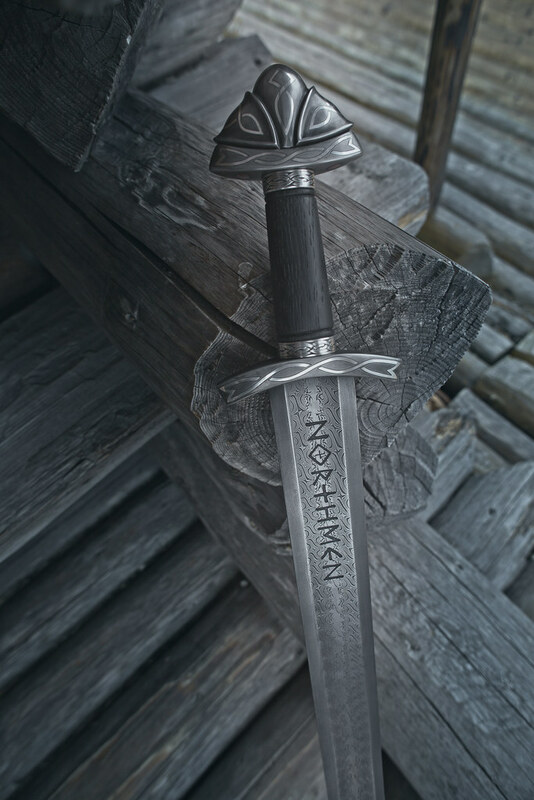 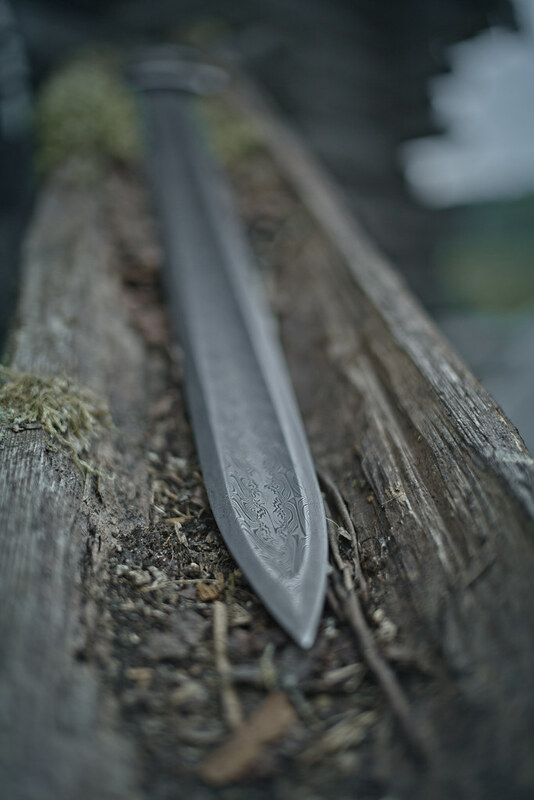 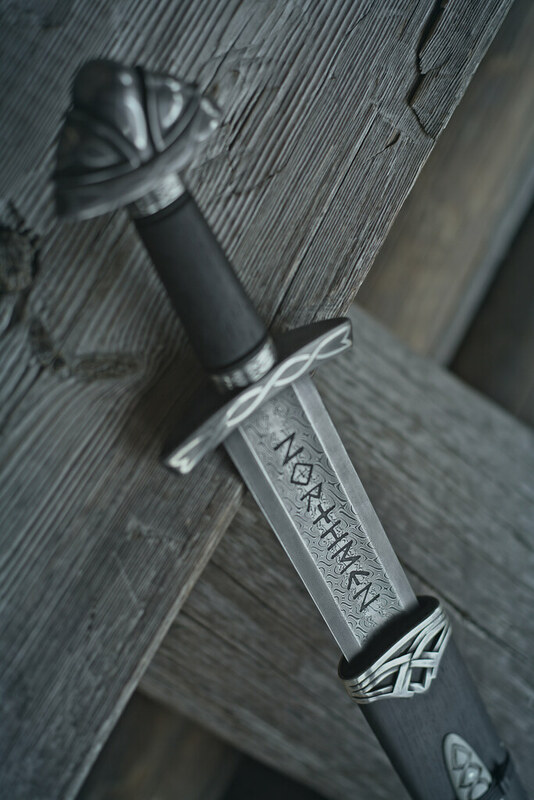 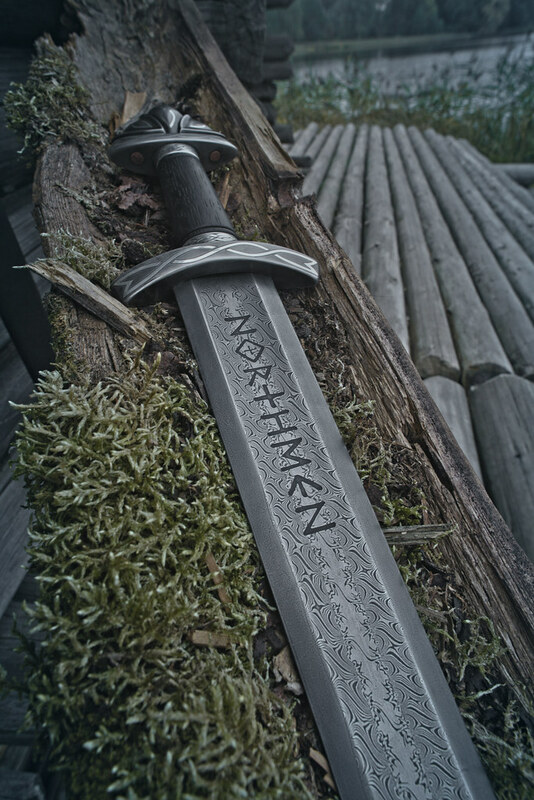 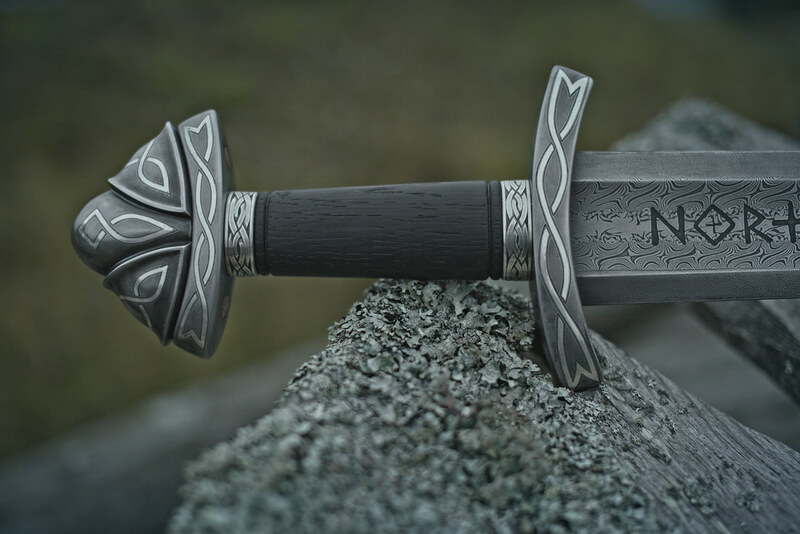 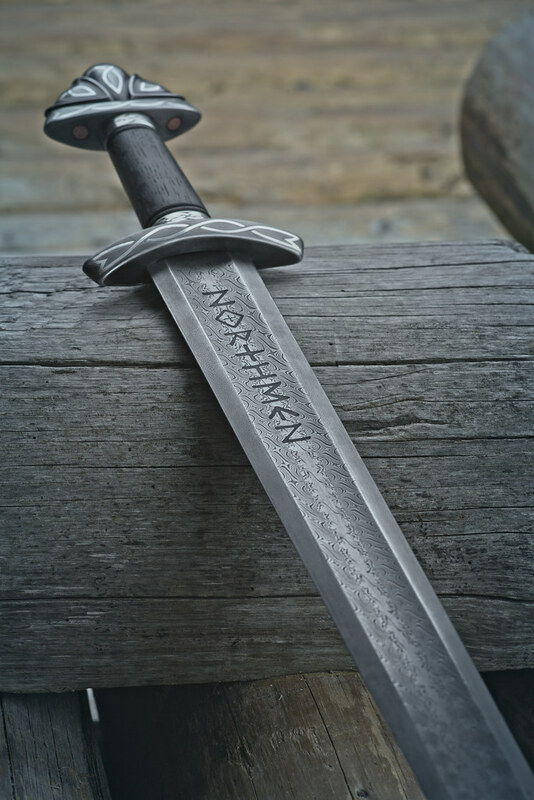 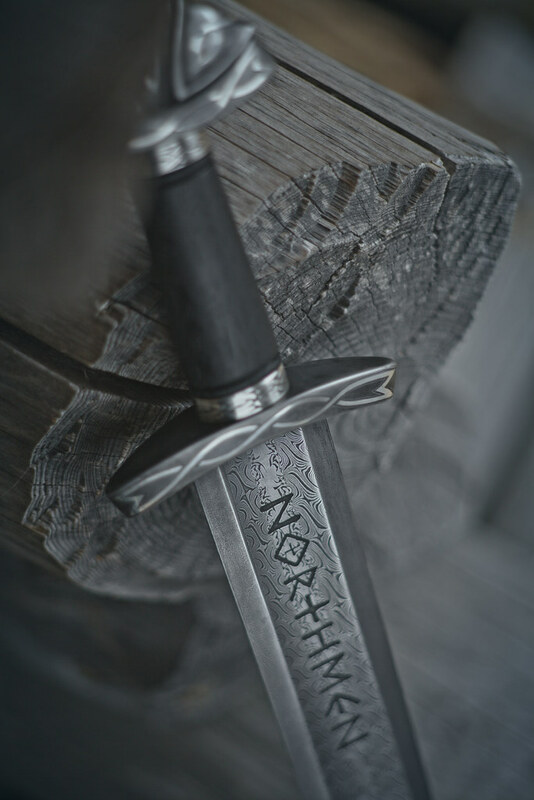 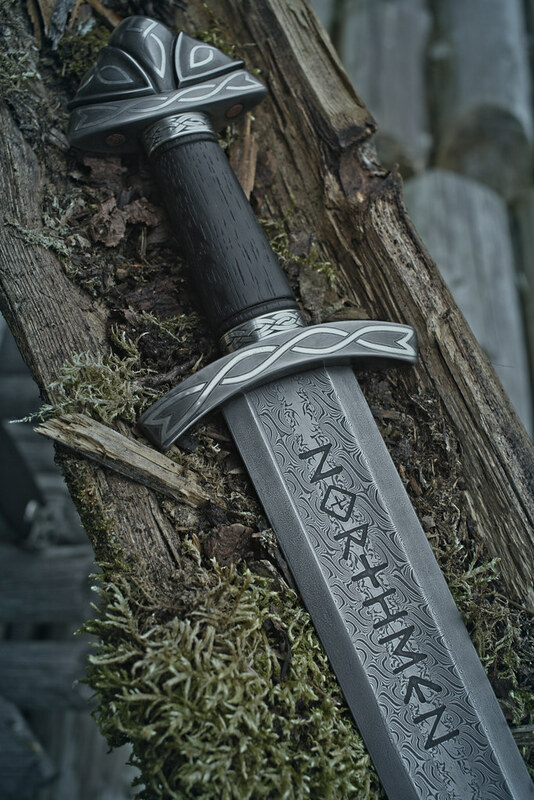 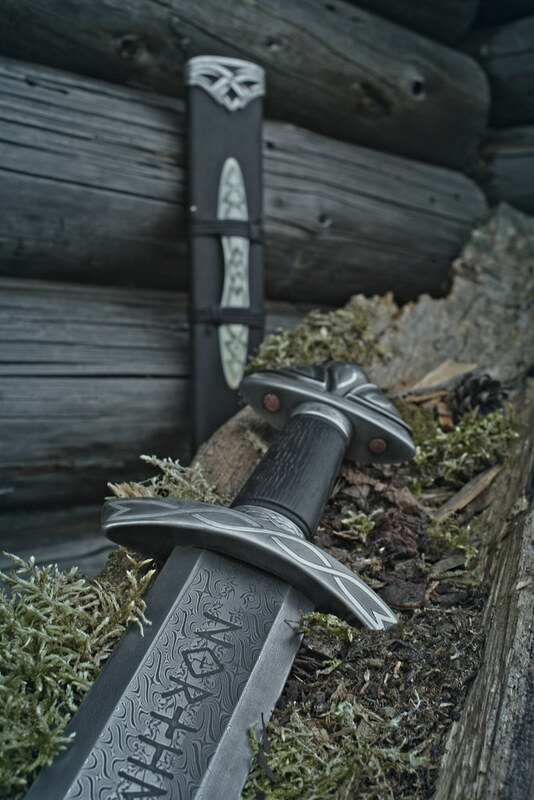 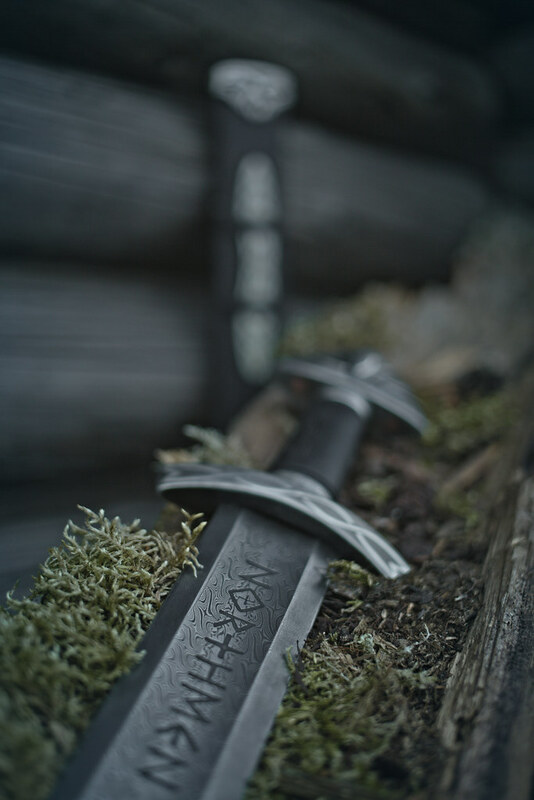 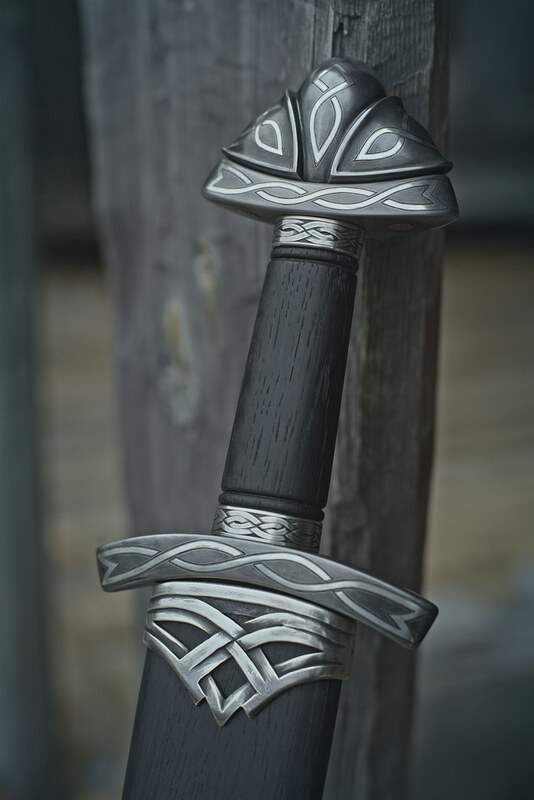 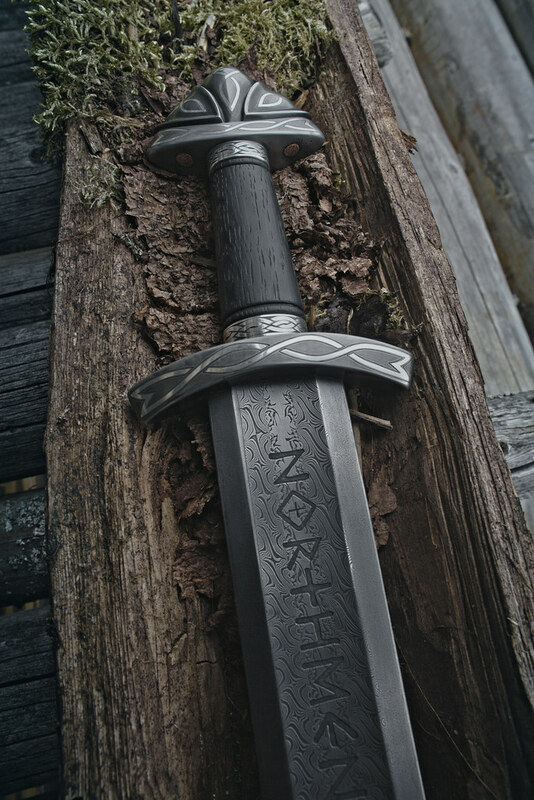 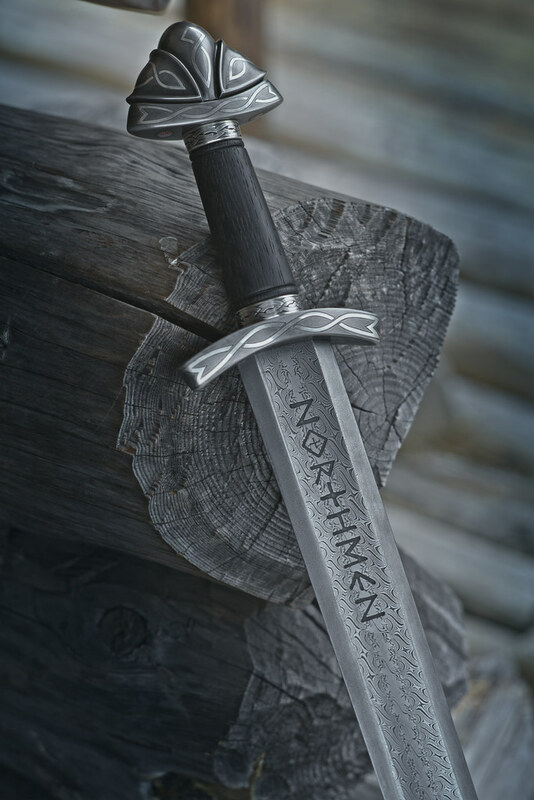 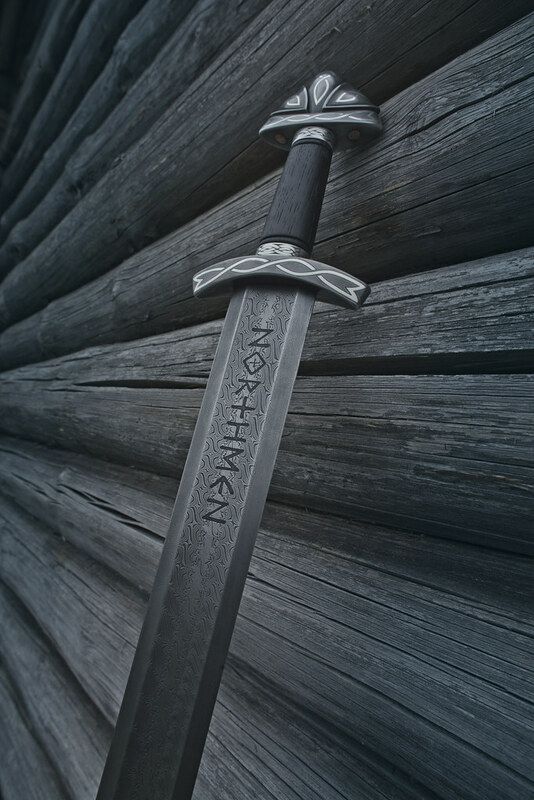 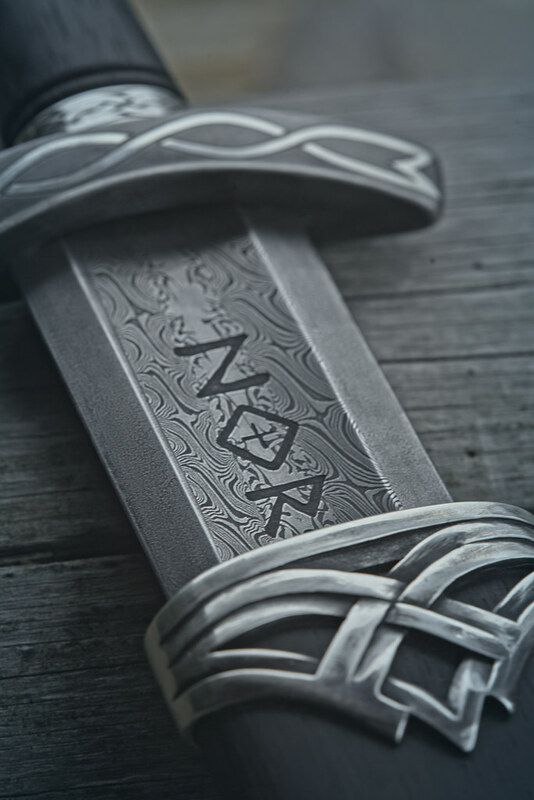 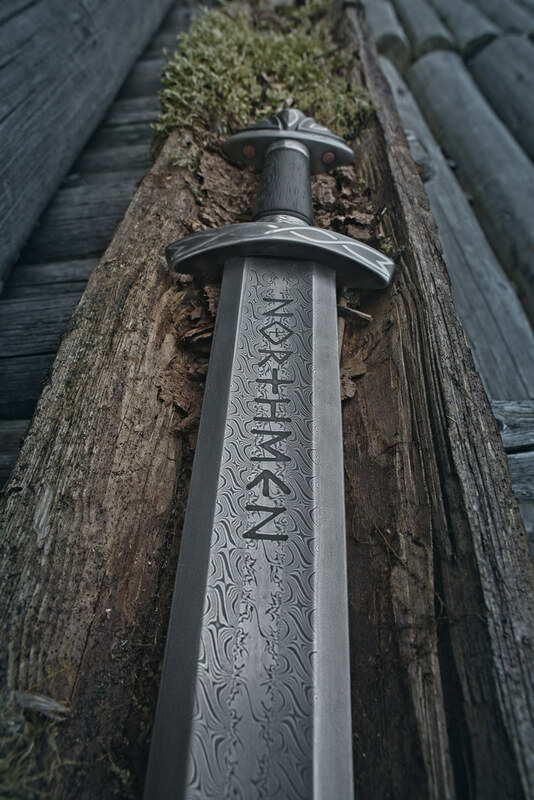 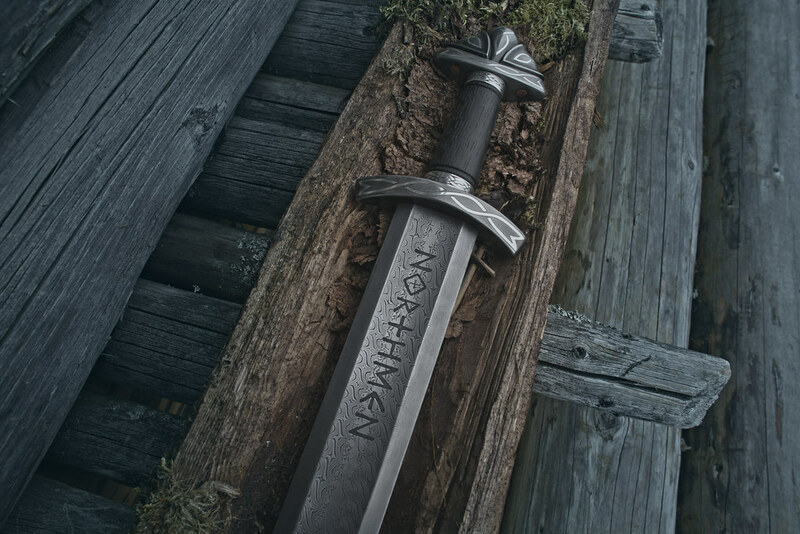 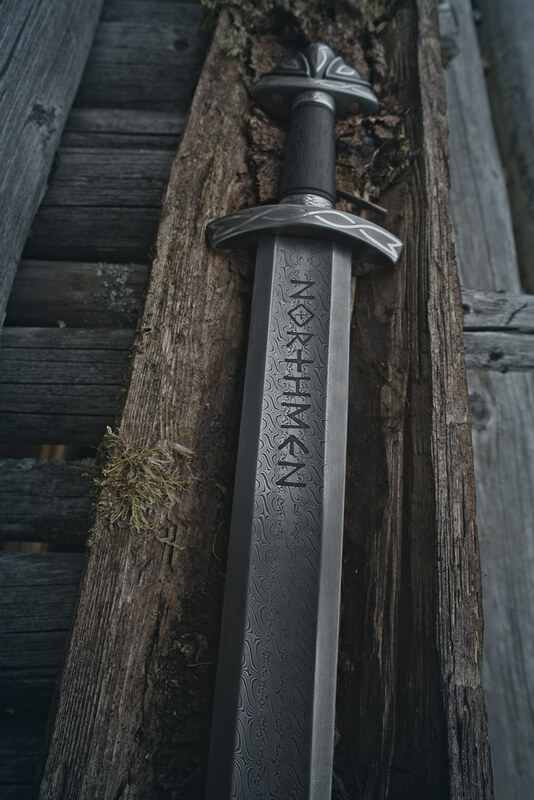 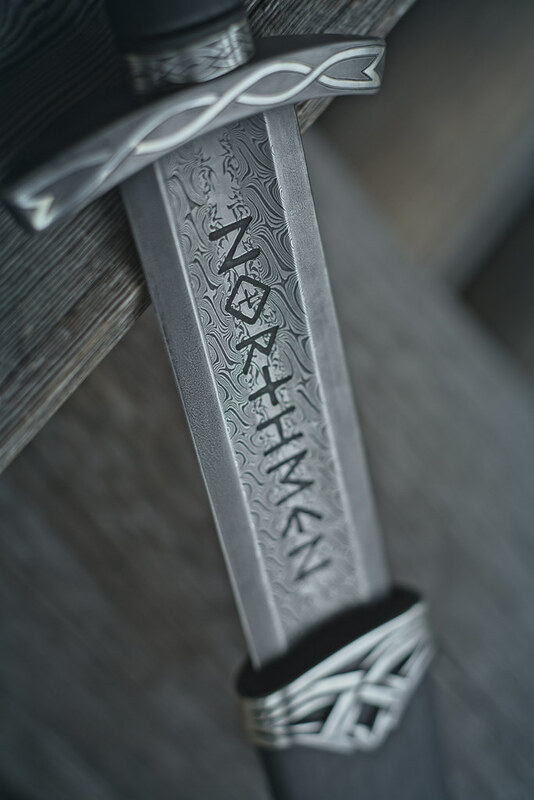 This Northmen Sword is created as our guild's symbol and dedication to the skill level of our guild's master craftsmen. 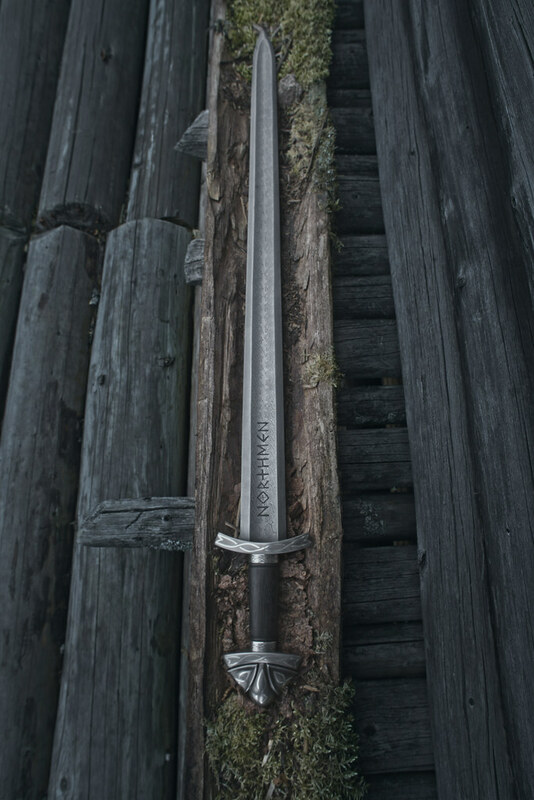 This sword will be replicated in the future. 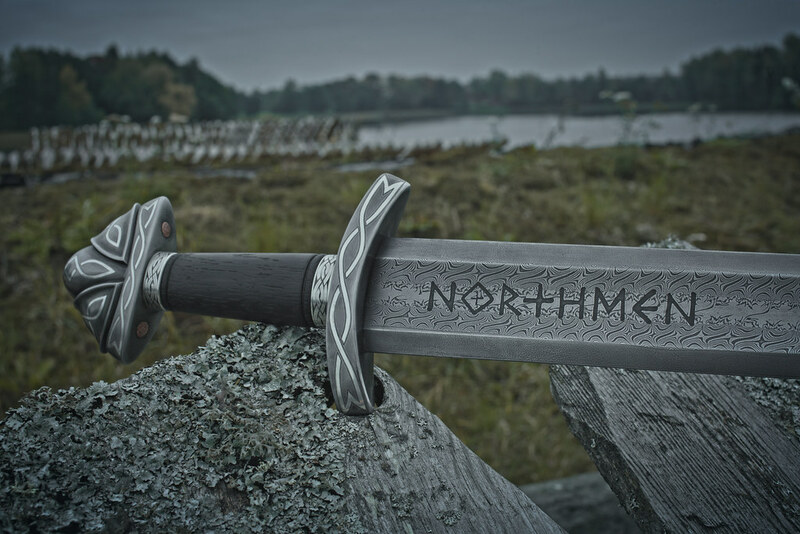 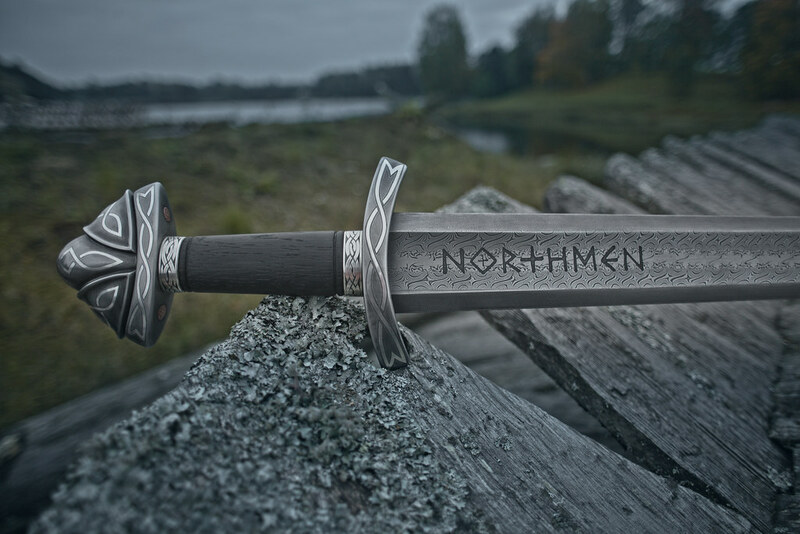 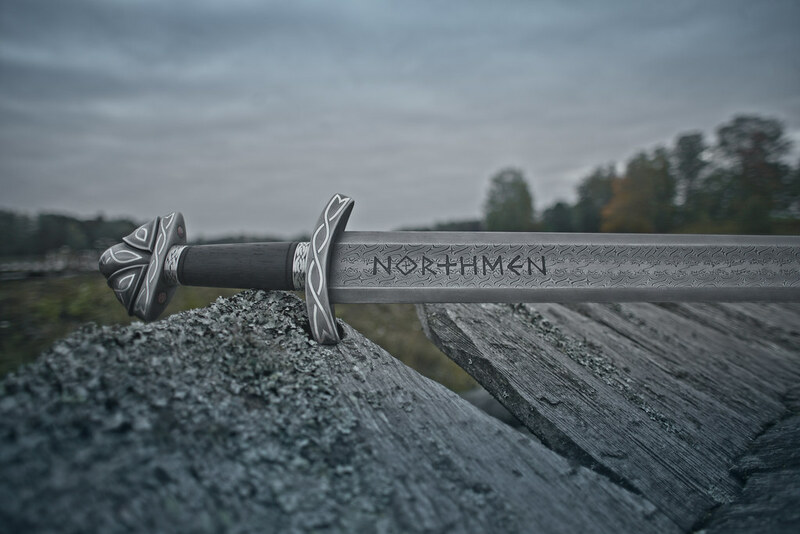 We can make no more than three of the Northmen swords per year, so there will be a waiting list created for those who would like to own the Northmen guild's symbol. 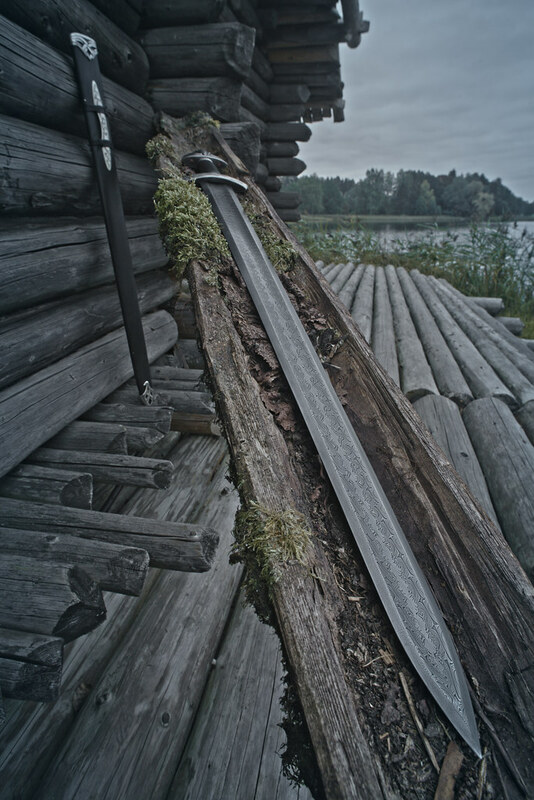 "For some a sword may be just that, a sword. 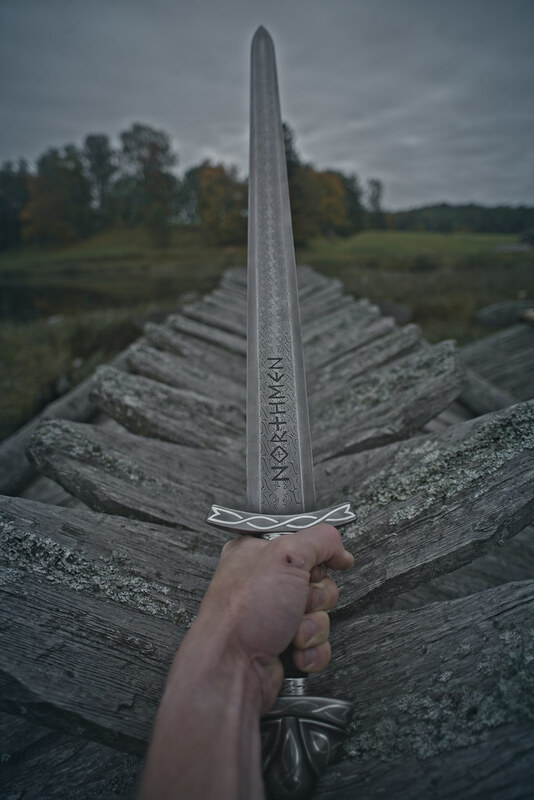 You may, I hope, feel inspired to live not in selfishness, violence, hatred and revenge, but instead with honor, respect, grace, and love towards other human beings. 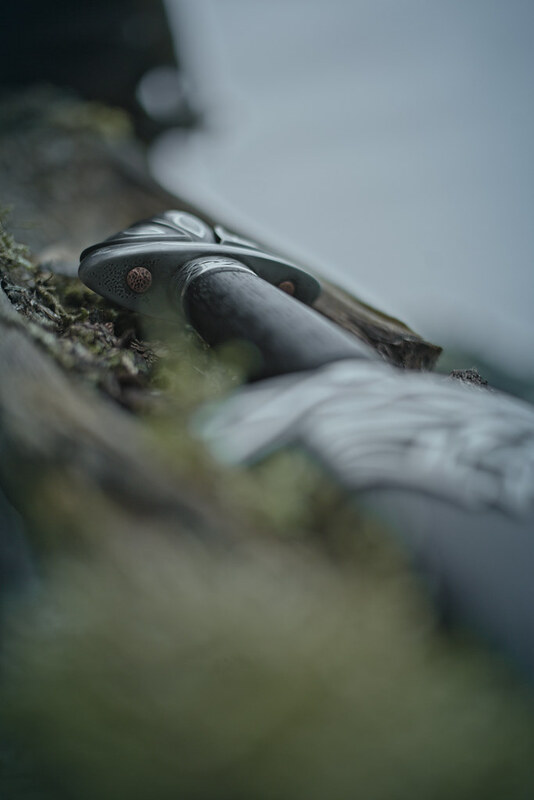 I believe in the idea that we are all living in a cosmic story that’s much larger than ourselves. 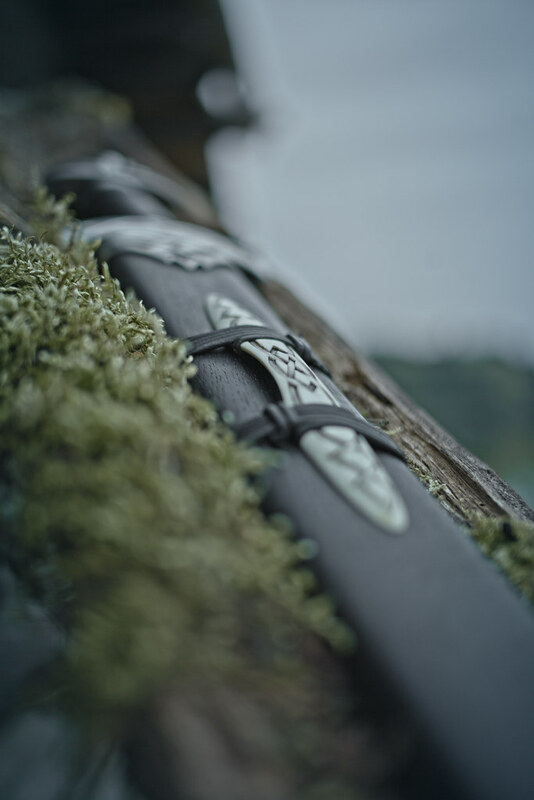 I believe in beautifully-absolute and unchanging Truth in the reality of good and evil, and that the split between the two resides within all of our broken human-hearts, which yearn for redemption and freedom. 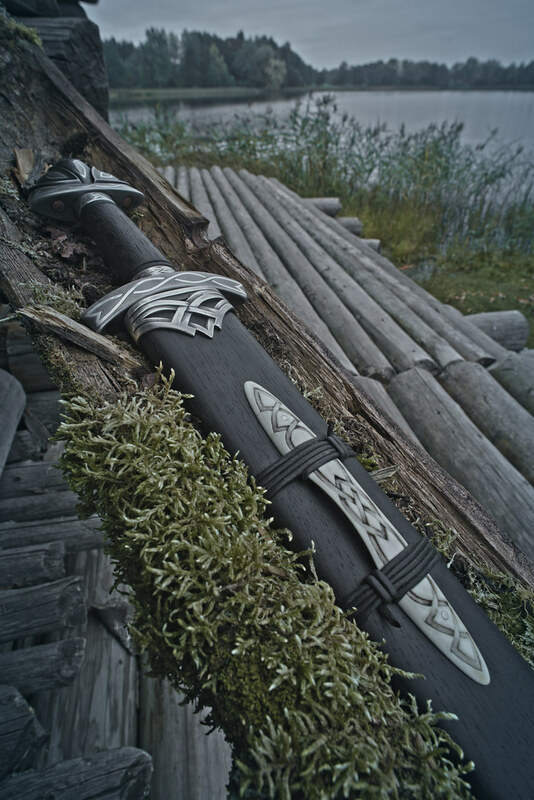 I think the sword is a perfect symbol to explore those truths, and delve deep into what makes human beings truly human. 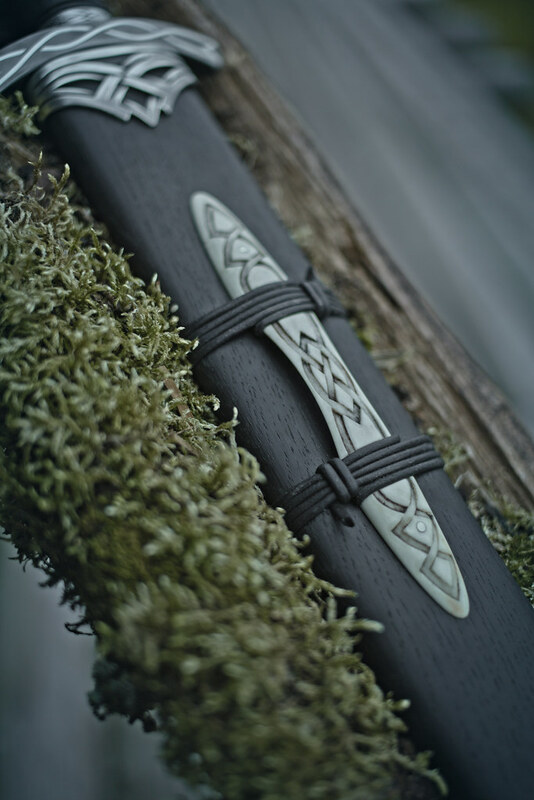 I hope that through my work I might inspire others to use the God given talents that we all have for a good and positive purpose, whatever it may be. 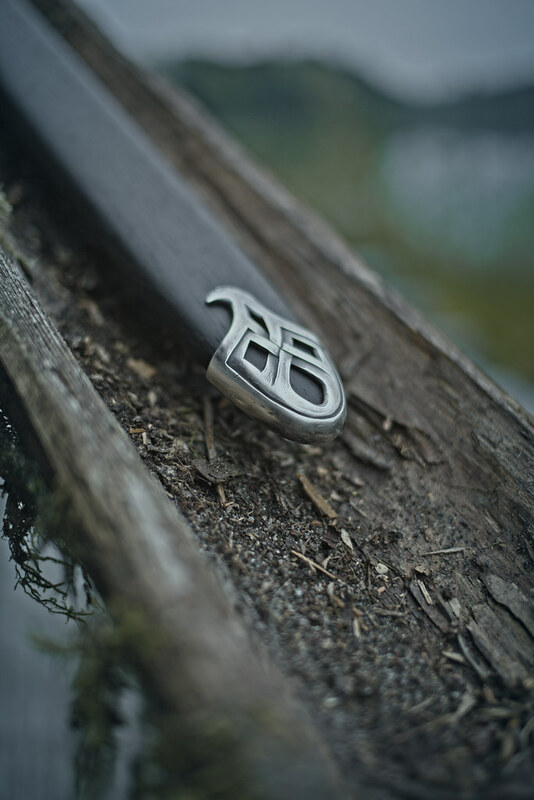 God bless – David DelaGardelle"